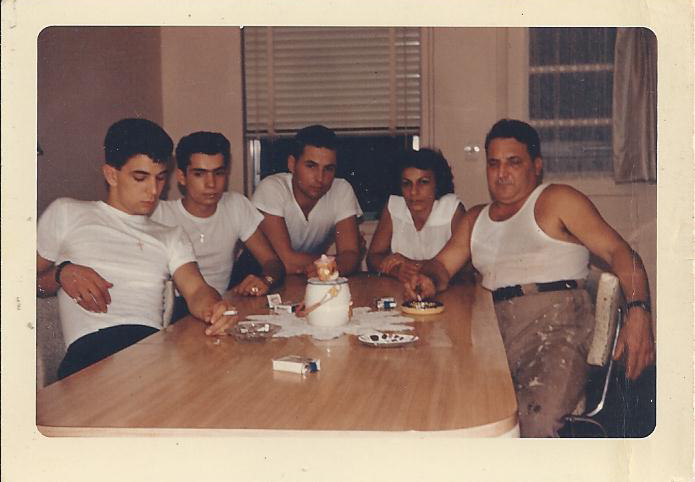 The scene at my grandparent's kitchen table, September 1962. I'm not sure why everyone looks so wiped out, it must have been a long day. My uncles and my father (from left to right - Uncle Tony, Uncle Augie, my father) look so Italian and so Guido in their white t-shirts, gold crosses around their necks, and slicked back hair. Of course, I think my father is the most handsome of the group! And my Nanny and Poppy (my mother's parents) look exhausted. But where are my aunts and my mother?? And where is the food?? And the ever present cigarettes and ashtrays bigger than macaroni bowls! I have one of the big crystal ones on the workbench with odd nuts & bolts. One of my grandmothers had some flip top contraption that they emptied the ashtrays into. Oh and the gallons of Gallo and other wine.